We finally get on-board the much anticipated TVS Apache RR310. 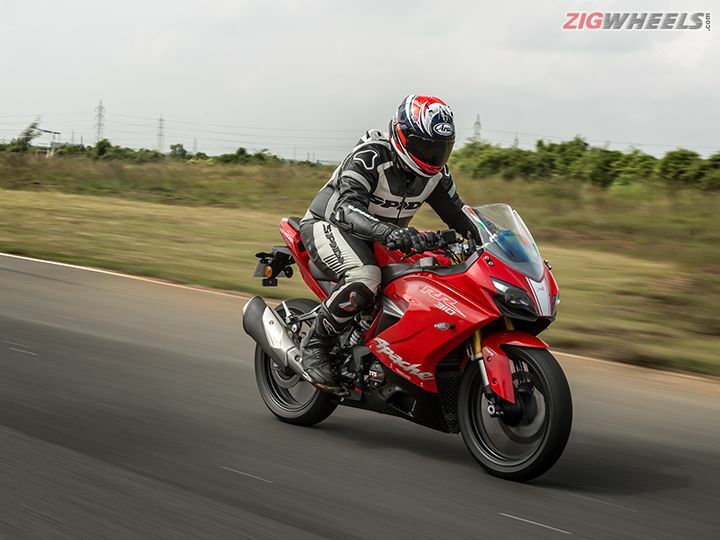 Here are our thoughts after spending a day riding it around the Chennai race track. Back at Auto Expo 2016, the TVS stall was a site of major hubbub, all of it for a new concept motorcycle, the Akula, standing on a lone pedestal. Now TVS has always been known for spectacular concept bikes at the Expo, but the Akula was something special. Razor sharp lines crafted in nothing but carbon-fibre and engineered in a wind tunnel, this was a proper little race bike. But that wasn’t all. Unlike the company’s other concepts, this one had the underpinnings - chassis, suspension, engine, brakes and even the wheels from the BMW G310 R - a bike that the German motorcycle giant and TVS developed together. There had been some talk in any case of a TVS version of the G310 R happening at some point, and this was it! This was almost two years back, and since then, the hype train for the Akula has just kept on steaming, with new spy pictures every few months signalling that the production version of the Expo concept was on its way. We would even go so far as to say that this has been the most anticipated Indian motorcycle of recent times. But the wait is finally over. It’s here! It’s called the Apache RR310 now, and before we tell you any more, we just gotta confess that it looks absolutely stunning. While the many spy shots of that emerged over the last couple of years did give a clear indication of how the final production version of the TVS Apache RR310 would look, photos don’t really do it justice. TVS says that the design inspiration behind this new bike was a shark (hence the name Akula, Russian for ‘shark’), and the crisp creases and sharp angles do remind you of this apex predator. Seen in profile, it’s a pukka little supersport machine, with its mass forward design and pointy, steeply rising tail. There are plenty of fantastic details as well, such as the tricolour decal on the windshield, the forged aluminium triple clamp and the red painted side-stand mounting bracket. Around the back, the “devil’s horns” LED tail light design is simply delectable, and the little fin that protrudes below it gives the tail an even sharper feel. Sure, seen from the very back, the tail does appear a bit wide when compared to the rear tyre, but almost all other angles are simply flattering to the RR310’s design. The vertically stacked instrument pod looks neat and is easy to read, even providing info such as fuel consumption, lap times and zero to 60kmph acceleration time. Up at the front the RR310 gets dual LED projector headlamps, which are supposed to have great spread and reach, but we can only attest to this once we do a thorough road test of the bike. Switchgear is straight off the BMW G310 R and the quality is absolutely top notch. We especially loved this Apache in its red and black paint scheme with it white racing stripes, and we really think that beautiful fairing has the lines to carry off pretty much any bright colour. But that’s not all the fairing is good for, as it has actually come from the RR310 spending hundreds of hours in a wind tunnel. Yes, that beautiful fairing has actually been crafted with aerodynamics in mind, and it makes for a drag coefficient (Cd) of 0.52 - making it the slickest bikes in its class (with only one other bike that matches it, which we suspect is the Ninja 300). This is one reason that the Apache RR310 is able to achieve a higher top speed (TVS claims over 160kmph) compared to the BMW G310 R’s claim of 145kmph, even though the engine and gearbox is identical to that from the baby Bimmer. The other reason why the TVS manages a better top speed is because of a marginally taller final drive ratio with a 17 tooth front sprocket and a 42 tooth rear (compared to the BMW’s 16-40 setup). Even the ECU has been retuned to get about 200rpm extra at the limiter. And it’s the TVS’ improved aerodynamics that allow use that taller gearing and extra rpm to clock a higher top speed. But in every other way, the motor is unchanged from the BMW’s. The 312cc single-cylinder liquid-cooled engine has a reverse inclined cylinder layout, that keeps the intake in the upstream air-flow. The cylinder also features a downdraft intake port that makes for an 8 percent gain in volumetric efficiency as gravity assists in feeding the fuel-air charge into the combustion chamber. This engine layout also has packaging benefits and has allowed for better mass centralisation. It’s peak power figure of 34PS @ 9,700rpm and peak torque of 27.3Nm @ 7,700rpm remains unchanged from the G310 R, and TVS claims a zero to 60kmph acceleration time of 2.93 seconds. Even the trellis frame has been carried over as is, with the only change being the rear subframe that’s been modified to suit the RR310’s sport riding posture. That has also bumped up the seat height to 810mm It gets the same 41mm Kayaba forks with their cartridge-type dampers, as well as the same Kayaba monoshock at the back. The suspension, just like the BMW’s, is not adjustable except for rear preload, but has been stiffened up to make for more sporty handling. The changed sprockets, but an identical length chain, have also pulled the rear wheel further in, dropping the wheelbase to 1,365mm - a 10mm reduction from the G310 R.
We got to put all the Apache RR310’s incredible engineering to test around the 3.7 km long MMRT circuit in Chennai, and our immediate takeaway was its handling prowess. TVS Racing’s inputs are evident here - 35 years spent in two-wheel motorsport and over 3000 hours of testing this Apache on various race tracks have led to a motorcycle that knows its way around twists and turns like the best of them. The RR310 turns in with the precision of a scalpel. Just a small push on the clip-ons and it’s pointing exactly where you want it to. At the same time, it doesn’t have the super-quick, almost twitchy steering of all the other Apache’s before it. This should mean that even newer rider’s will be able to quickly get comfortable with the way this handles. Through the fast sweepers at the Chennai race track, such as Turn 1, infamous for catching out newbies who commit into it without thinking, or the super-late-apex Turn 7, also known as the ‘Big D’, the RR310 is absolutely planted. And that’s thanks to its long wheelbase setup. Transitioning from one side to the other, through the essess was an absolute joy. With its manageable kerb weight of 169.5kg, it changed direction with the poise of a proper track-tuned motorcycle. But just because it felt track-tuned, didn’t mean it was a super stiff machine that would be unforgiving over any surface undulations. Suspension tune proved to be magnificent, and it handled some of the bumpier sections of the track without batting an eyelid, even when completely cranked over to one side. Unlike most single-cylinder motors, the RR310’s power delivery is absolutely flat. There’s no hit of torque that comes in at any point in the rev band, and the bike accelerates in an absolutely linear manner when you open the gas. So while it might not ‘feel’ quick, it’s actually picking up speed at an alarming rate and you realise this only when you happen to glance down at the speedometer. On the track, this linear power delivery works great. It’s predictability has you opening the throttle hard coming out of corners with the assurance that there’s going to be no sudden burst of torque that will upset traction at the rear wheel. The pull is clean in any gear and at pretty much any rpm, and the free revving nature of the motor has you hitting the limiter at 10,700rpm before you know it. If we had to nitpick, there’s one area where the RR310 didn’t feel completely brilliant, and that’s braking. Don’t get us wrong, the 300mm petal disc with its radially mounted caliper has plenty of bite. But there’s almost no braking to be had in the initial lever travel, requiring a much firmer squeeze to start shedding speed. Once you have pulled in the lever quite a bit, it does shed speed quickly, there’s no doubt about that. And there’s dual channel ABS as standard, so you can actually grab a handful of brakes without having to worry about locking up the wheels. However, it did leave us wanting for a more precise feel. Out on the track, the RR310 is a ridiculously forgiving motorcycle. However, to actually extract it’s complete potential needs a certain amount of riding skill. So while it doesn’t punish hamfistedness, it absolutely rewards finesse, and that makes it extremely engaging bike to ride. That said, to make this Apache sing on the track, we needed to dial up the rear preload a few notches and drop pressures on the Michelin Pilot Sport tyres by a couple of psi. With both of these in stock settings, there was an indication that the bike felt more road-biased. While we didn’t get a chance to take the RR310 out of the track environment, we get the feeling that this is a bike that will do just as well on public roads. The suspension certainly seems to have the sophistication to handle bumps and potholes in the real world. And the same spacious ergonomics that allowed us to move around easily on the motorcycle when throwing it around corners should work well when either commuting or riding long distances. The motor’s linear power delivery too should make it a relaxing ride in the urban jungle. TVS has also done a very smart thing to ensure more comfortable city riding. Specially designed ducts in the fairing extract heat away from the radiator and venting it below the motorcycle. So in chockablock city traffic, this should go a long way in keeping heat away from the riders’ legs. For what it’s worth, we did manage to try some slow speed riding on our in-laps on the track, and figured that there’s plenty of bottom-end to be had from this engine. It picks up easily from speeds as low as 40-45kmph in 6th gear, even when riding two-up! And speaking about riding two-up, the pillion seat is comfortable enough, but at the end of the day, this is a motorcycle with sporty ambitions, and that tall tail might not make for a very relaxed perch for most. But those with more touring ambitions will appreciate the fact that it will sustain 100kmph at a little under 7,000rpm, making it an easy-going highway motorcycle. That said, we experienced some vibes around this rpm when we were riding, but that was only on a couple of the test bikes, and TVS says that these are being addressed. Ok, coming down to the bottom line. TVS always maintained that the Apache RR310 will be a premium offering, and has priced it as such. At Rs 2.05 lakh (ex-showroom), it pretty much takes the likes of the KTM RC390 head-on. But is this Apache’s high pricing justified? Well, if you just do a comparison on paper, then no! More performance can be had for only a little more more money, and the RR310 doesn’t really kill it in the horsepower per rupee fight. But horsepower isn’t the only way to judge a motorcycle’s capabilities. The Apache manages to strike a great balance between outright performance and everyday usability. To top it off, the build quality is absolutely top-notch and the bike looks absolutely drop-dead gorgeous. In that sense, you do feel like you’re getting a lot of motorcycle for your money. And while it’s not without its flaws, we do believe that it has what it takes to upset the order.